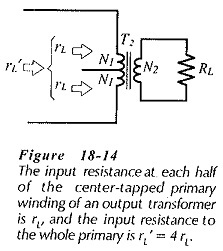 The transformer can now be specified in terms of the output power (Po), the load resistance (RL), and the referred resistance (rL‘). Each transistor is on for half of each cycle of the input signal, so the power dissipated in each transistor is half of 2 PT. The transistors are specified in terms of the device power dissipation (PT), the peak current (Ip), and the maximum collector-emitter voltage (VCE(max)). 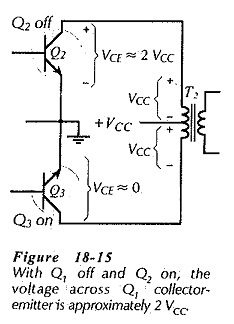 The transistors must also be operated below the maximum power dissipation curve. Poor frequency response is one disadvantage of Transformer Coupled Amplifier Design, both at the low and high ends of the audio frequency range. This can be improved by the use of overall negative feedback. However, substantial improvement in frequency response can be achieved by eliminating transformers from the circuit. The alternatives are capacitor-coupling and direct-coupling of the amplifier load.